One issue continually revisited by Japanese video games, and the writing and storytelling culture that infuses it, is the idea that the world is corrupt in many ways, and it must be changed – but breaking it entirely is cruel and indeed, quite genocidal. So we half-break it. What I mean is, in a game like Tales of Vesperia, the “end villain” isn’t really a villain in the sense of desiring nothing but ill; he’s just an enemy of all humanity because he figures that humanity is the problem. His being born human isn’t at all the point. He just sees humanity as destroying the natural world for its own sake. In this case, leaving the world as it is leaves it hurtling towards destruction. Breaking the world and cleansing it of all mankind preserves the ancient natural world, at the cost of wiping out all of the infinite possibilities of humankind. The result that the “good guys” aim towards is to change the world, which violates the “protect the old order” stuff (which is why you have to fight that guy, since he intends to veto that plan), but which gives humanity a chance, and gives a new lease on life to a world that wasn’t all it could be by any stretch. In the Final Fantasy series, generally speaking, any good that comes out of things is a result of overcoming an apocalyptic threat that threatens to destroy the world, space-time as we know it, and so forth. The entire world is rocked and changed and comes to the brink of destruction, but is spared through heroism and sacrifice and great deeds. The future is not dictated by this victory; instead, the possibilities that the future can hold are protected, and the exact form the future will take is left to others. These kind of themes are simply too widespread in Japanese gaming, particularly in the RPG genre, to ignore. So the question arises, why? Why is this the form it takes? I mean, totally aside from clearly defining something for the characters to do, which is kind of important for a game, why this form? Why not a good world to be protected nobly, for instance? Let’s look, with as much sensitivity as we can, to the atomic bombings of Hiroshima and Nagasaki. The world that native soil Japanese (“nihonjin”) knew was shattered completely. Now, things had been getting harder and harder, sure. It was war. The unrestricted submarine warfare on an island nation was having effects that it never achieved against the British isles. Nonetheless, the atomic bombings were a cataclysmic end to the world that people had known. Yet it was not the end of all existence. Though Japan was fully conquered, its laws rewritten and all but the barest fig leaf of imperial rule left standing, this was the gateway to what eventually became a brighter future. In spite of modern economic stagnation, Japan is light years away from the ruin that it faced at the end of WWII. In other words, the world known to “nihonjin” was half-broken – and things got better. Now, this is not to say that everyone is happy with every aspect of the outcome. But, we’re talking about fantasy RPG’s here. One fantasy, which is really just a very big fantasy, is changing the world. Yet changing the world, without becoming the villain of your own story and being justly hated by all good peoples, requires a big set-up. So, it’s entirely understandable that the “good ending” becomes change riding on the back of the villainy that aims to break the world fully rather than half-way. Without this villainy, the world could never have been changed; it would have remained stagnant. Yet the villainy is villainy because it aims to go too far in pursuit of a chimerical absolute, a final solution that is too final to resemble anything good people could want. Some sacrifices are simply too high – and this is coming from a nation that sacrificed plenty in pursuit of imperial war aims. So every day, game players throughout the world participate in half-breaking the world. Except, in these cases, they are active participants searching for better solutions, not simply following blind ideologies because they offer a perfect path in theory. To the extent that Shinto respect for nature shines through a lot of games, and movies and books as well, it is not just because nature is thought of as a good in itself. In addition, it is open-ended without the promise of absolute solutions. When a nation has been buffeted by cataclysmic negative change under the rubric of absolute nationalism, yet finds industrialization, corporatism and so forth to be lacking in soul and somehow hollow and incomplete, there is a reflexive cultural reach back in time to roots that feel safe, comforting, and non-threatening. Most of what we see in video games concerning this isn’t actual Shinto; it’s emanations of the same general idea. Take the Tree of Mana in the Seiken Densetsu series (known in the west as Legend of Mana). This is basically a spin on Yggdrasil, the World Tree of Norse mythology. 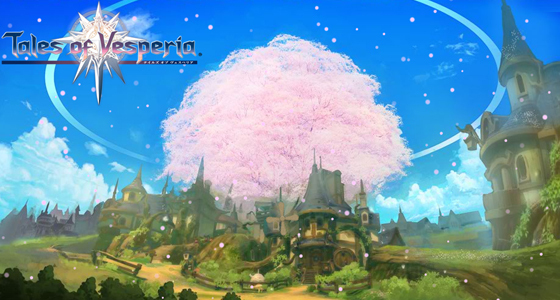 This tree also figures very prominently in the original Tales of Phantasia, while a merely giant tree is featured as the more or less guardian angel of an entire town in Tales of Vesperia, which is shown in the above picture (in blooming form). So why not go all nature? Why not aspire to a world without humans? Well, totally besides the fact that we don’t, broadly speaking, try to commit self-genocide, we’re seeking a middle way that allows cohabitation with nature, and the enjoyment thereof, without strangling it. Also, the simple fact is, advanced technology is cool and entertaining. It draws us to games, comic books, movies, futuristic novels, and so on. These are the worlds of cyberpunk, mobile suits, and space ships. In other words, an awful lot of this is just very elaborate expressions of our human search for a better way: not completely industrial and urban to the point of abandoning not only nature, but our very own human spirit… yet without abandoning the entire idea of civilization, without which we simply cannot thrive as a species. This entry was posted in Culture, Japan, video games and tagged change, culture, fantasy, final fantasy, heroes, Japan, RPG, storytelling, Tales of Vesperia, video games, villains, writing. Bookmark the permalink. Hey! This is my 1st comment here so I just wanted to give a quick shout out and tell you I truly enjoy reading your articles. Can you recommend any other blogs/websites/forums that deal with the same subjects? Thank you! Good question! I need to look harder for them. When I find them I’ll try to post about them and put them in the blogroll.